The evening chill has arrived, bringing a sharp end to Summer’s outdoor sprawl and turning us towards the cosier, comfort of indoors. If you are starting to feel that yen for crackling fireplaces, smooth red wine and heartier food, here is a warm pairing of Avondale’s La Luna and a traditional Osso Bucco that is perfect for an Autumn night. 1. Dust the shanks with flour and pepper. 2. Heat 30ml of the olive oil in a heavy-based pan and gently sauté onions, carrots, celery and garlic until softened and the onions are golden. Transfer to a casserole dish. 3. Heat the balance of the olive oil in the pan and lightly brown the shanks on all sides. 4. Pack the shanks on top of the vegetables in the casserole dish. 5. Discard the fat in the pan and pour in the canned tomatoes and their juice. Add the stock, wine, basil, thyme, bay leaves, lemon rind and season to taste; and then gently bring to the boil. 6. Pour sauce over the shanks and vegetables. 7. Cover the casserole dish and bake in a pre-heated oven for 1 and a half to 2 hours, until the veal is tender. 8. Mix the gremolata ingredients together, and sprinkle over the top before serving. 9. Serve with mashed potato or couscous and a fresh green salad. 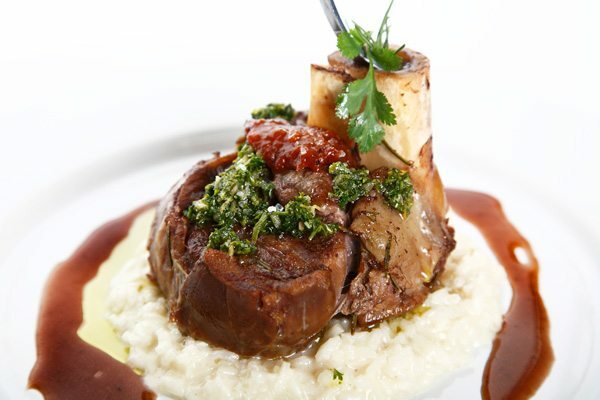 Pair Osso Bucco with Avondale’s La Luna 2006 – the soft suppleness of La Luna reflects the graceful ways that Avondale is attuned to cosmic influences and rhythms. In following Biodynamic practices we are mindful of the astronomical influences on soil and plant life. La Luna is made of organically-grown Cabernet Sauvignon, Cabernet Franc, Merlot and Petit Verdot grapes. This velvety and elegant classic blend offers scents of cedar, truffles and dark fruit with subtle forest and herb undertones. Full plum and mulberry flavours and soft tannins combine for a lovely, vibrant suppleness. At Avondale, the image of the moon is symbolic of the way the universe influences our living system. By observing the powerful phases of the moon, we fine tune our activities in the vineyard and cellar to be in harmony with the celestial forces.